" The universal advantage of providing charity work is that you are offering your time and services toward the greater good of your community. 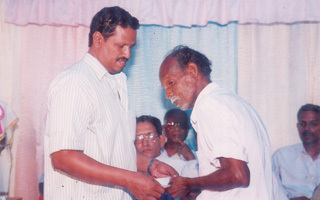 It helps build a stronger community"
We have extended our humble contribution towards improving the quality of the life of the disadvantaged people by successfully implementing our social projects like “A home for the Homeless” .To ear mark the Golden Jubilee celebration we have donated a home to a homeless widow. We also help in reconstruction of homes of the poor and the marginalized. Besides, we have been successfully supporting agricultural activities, small enterprises, small trade organizations and petty entrepreneurs through need based funding.